This wasn't my first time taking pictures of families with newborns. Their son Aden, was only 2 months old, besides fun it was easy to photograph the Kim family, I didn't have to give many directions and they could go naturally, so I just took shoot and shoots. This sweet family was from South Korea who at the moment lived in Hong Kong. They even already gave me great compliments and excellent reviews on Google although I didn't put up their photos on the blog yet! I'm very flattered and feeling lucky having the chance to photograph them. 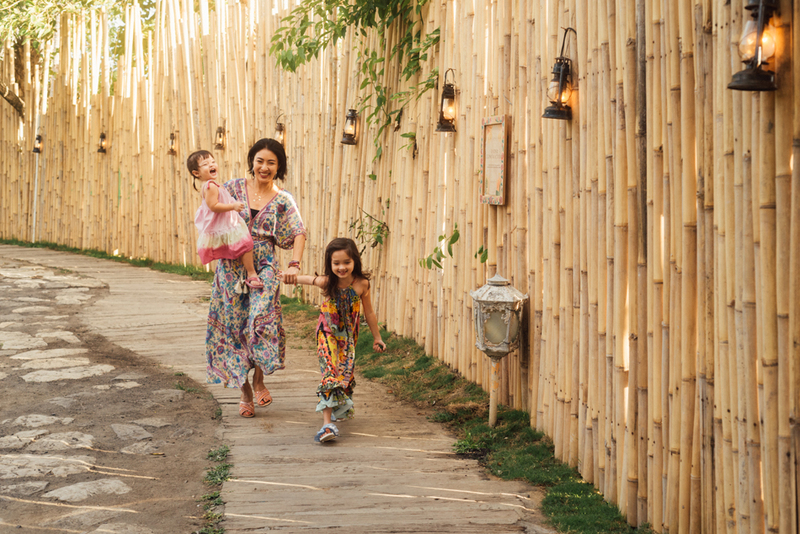 All photo sessions were done at two different villas where they stayed during their holiday in Ubud. 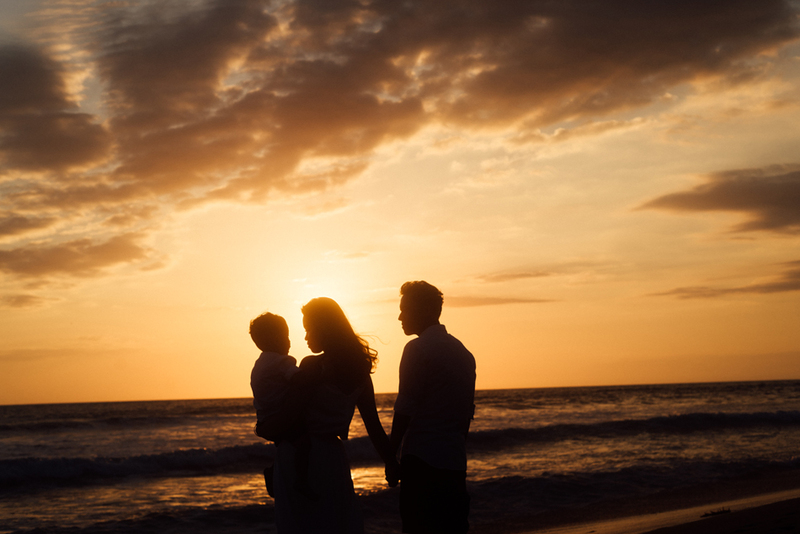 In the photo sessions Janet and husband seemed caring, their abundant love to their little one was shown beautifully. How true a saying was "no truer love than the love of parents for their children"
Do you have plan to do elopement / wedding at a waterfall? Would you like to do it in Bali? All that is so possible, Bali has several beautiful waterfalls to make your dreams come true. Most waterfalls here have easy access, thus, reaching the spot won't drain your energy. Some of the falls are Tegenungan / Blangsinga, Kanto Lampo, Banyumala, Tibumana, Gitgit, Munduk and Melanting. 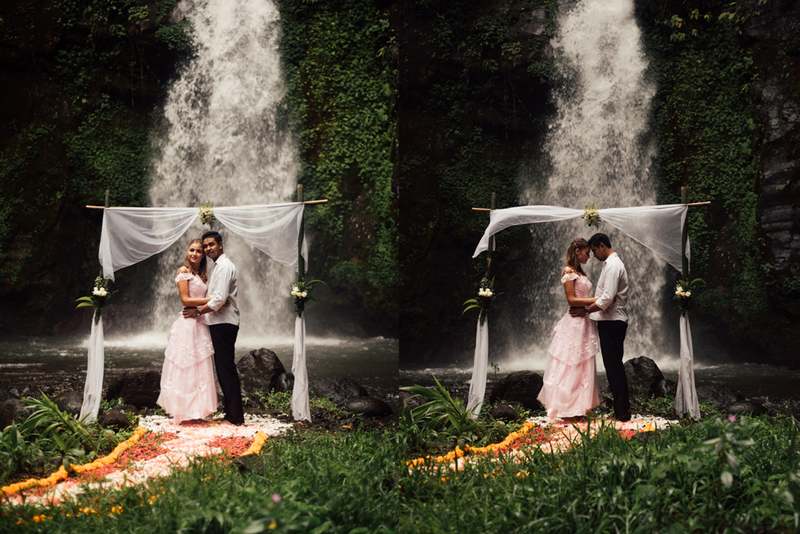 This photo session was done at Batu Lantang in Petang, this beautiful waterfall can be reached within an hour drive from Denpasar. Still very few visitors to this waterfall, and the trek was quite easy, you would see also some local houses with their natural lush gardens. You've got time and still in Bali? Go visit it! This was the third time that Belinda had been using my service to capture their holiday photos in Bali. Nothing could be more important to me from a client than a trust that they gave this big, and that really made me happy. Belinda this time did a photoshoot with her two girls only without the presence of her husband. Apparently she and her daughters came to Bali early and while her husband was still in Singapore and would catch up soon after. That afternoon we met at La Laguna, a very attractive venue for Belinda and her two angels to have a portrait photoshoot. It was so easy to capture them on my camera. As I began to take some shots, they went all natural in poses without much of directions needed, and especially for Belinda's solo portrait. A beautiful afternoon, sit back, relax and enjoy their photographs. This was my another intimate pre wedding photo session which was done at Villa Hodeout Bali. A very cool bamboo home that had uniquely design with eco-friendly materials in their property, it was a very soothing dan relaxing place to release the tiredness and having a holiday. Dek Ayu and Febri came with this idea to do a pre-wedding photo session at Hideout while exploring the beauty of Sidemen nature. One of the villages that had a very beautiful nature and landscape in Karangasem. 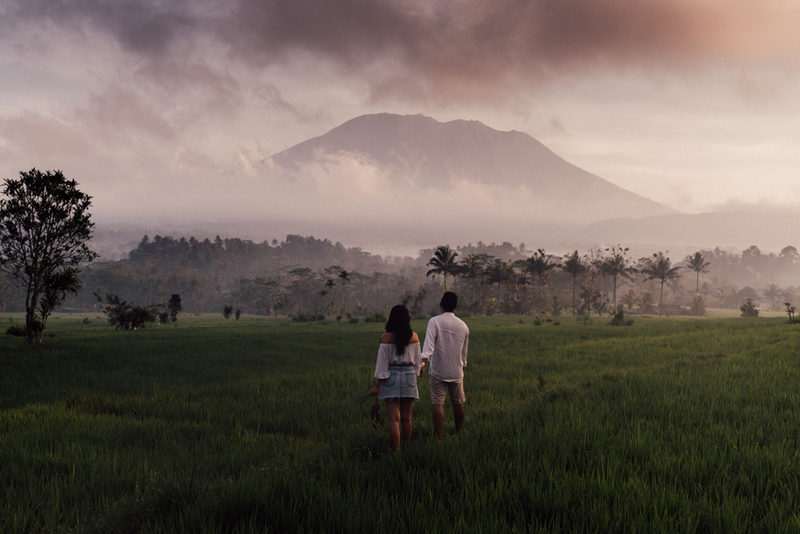 Rivers, forests, plantations, rice fields plus with the existence of Mount Agung, the grand volcano, would make anyone love to stay or even living for a long time in Sidemen. The first time I met Febri and Dek Ayu it was last year in Yogyakarta, we spoke a lot about their dreams and love story. A fun couple to hang out with. There were alot of places we should've had visited for the photo session, but since there were one and other things, the plan didn't work out. Yet, I was happy to know them and did this photo session, the last time I saw them was when I gave them these pictures, they were excited with the result. Hope you like them too! Enjoy! For the very first time I captured Family Photos at Morabito Art Villa, whereas usually this place was more often used as a wedding venue, a very artistic place. For that very reason An Family that lived in Cambodia came to Bali, they attended a wedding invitation and had a few days of holiday in Bali. Rika and her husband were very attentive looking after Moly, their only child, which that afternoon was more interested in swimming after seeing his friends and relatives were having a good time in the swimming pool. Moly had a toy camera, sometimes he did a photographing position with it with funny and cute actions. No doubt he made me laugh a lot. Hopefully one day I would see them again in Cambodia, perhaps for a family photo session again with the new family members.